I have much to share, but for now I'll leave you with a look at Linq. The first phase opened last month. You can now frequent Starbucks, Haute Doggery, Purple Zebra, Chayo Mexicano Restaurant and O'Sheas casino. This open air dining and entertainment district is a great improvement from the old alley that used to host a few event each year. As more places get established and the High Roller Obervation Wheel opens it will really come alive. I'm personally looking forward to the return of Ghiradelli and the opening of the Yard House, which will be the largest of its kind. I really like what they've done with O'Sheas. It's clean, fresh and more roomy than the original. Yet, it feels like a traditional Irish Pub. Drink specials and lower limit table games remain, and beer pong has not been forgotten. There is live entertainment indoors and I appreciate the addition of the outdoor patio and bar. It will be great when the mercury begins to rise. The Purple Zebra is no ordinary daquiri bar. It's self serve and it has a plethora of vessels for you to choose and fill with daquiris (or candies) to your heart's content. If you'd rather skip the booze, there is an alcohol free slushy selection too, and the other side of the store is dedicated to confections and other sweet treats. Slush samples are encouraged. The Fireball is a crowd pleaser, I was told it goes well with the Peach. If you like Holsteins, you'll probably fancy the Haute Doggery. I believe this is the introduction of gourmet hot dogs on the strip. Starbucks provide yet another convenient location to get your caffeine fix. Chayo brings a mechanical bull to center strip, perhaps a flight from their tequila bar will provide enough courage to give it a go?! Diners have seemed pleasantly surprised by the eats over on Yelp. It might just be an ideal place to get a fun night started. I've been singing praises for Sage for a while now and it remains my favorite strip restaurant. A friend just moved back from a stint in the Bahamas and we chose Sage to welcome him back. 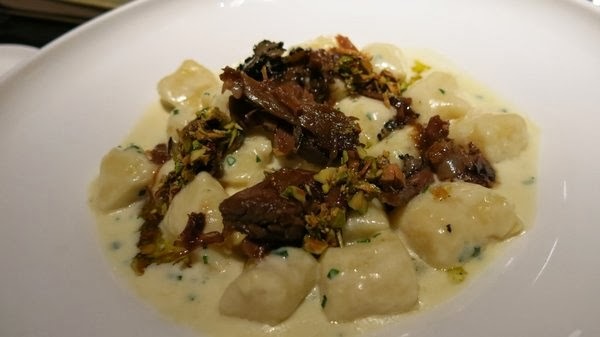 We stuffed ourselves silly on sweetbreads, bison pastrami, NY strip, duck breast, and Iberico pork; It was all fantastic, but it was the gnocchi with braised lamb and black truffles that really stood out. It took me right back to La Taverna di San Guiseppe in Siena, Italy. It was there that Frank changed his mind about mushrooms. After having their gnocchi with porcini and truffles, he's loved mushrooms. To date that meal was simply the best. This gnocchi at Sage was the best I've had since. The pillowy potato dumplings are dressed in rich cream and the pistachios give a nice crunch and a slightly sweet bite, which is perfect against the earthy bold flavor from the truffles and tender braised lamb just makes this the ultimate comfort food. We devoured the plate before I even thought about snapping a photo; the one above seems to be lacking the truffles. The version with black truffles will set you back $41, but it's well worth every cent. Sage's menu is seasonal so it won't be available for long. If you have the chance get it while you can. I took an unexpected hiatus. You see, Frank's dad hasn't been well for sometime. He's suffered from early on-set dementia for several years. He's aggressively declined in the past three years. Then, right before Thanksgiving, he continued to decline at a rapid pace. Unfortunately, January 4 cardiac arrest struck, paramedics were able to revive him but he was unable to breath on his own. Thankfully, I was able to get Frank on one of the last flights before all were grounded to Midway due to the snow and artic blast that hit the Midwest. The following days were heart wrenching. I flew to Chicago via the Twin Cities on January 8. My flight departed at 10:20am. His dad, Frank Jr. passed away only a few minutes later. I learned of the news via text while taxiing to the gate. My heart ached for Frank, I hated that I wasn't available for my husband in such a time of need. I sobbed for his loss. Frank Jr. was only 59, that is much too soon to lose a father... a husband... a brother... However, at last, he found peace. He was no longer void of memories and familiar faces. I know he will live on through us, when we recall special memories and fun times had fishing, playing cards, bowling, betting on the ponies and winning jackpots in Vegas. That layover and flight was only a few hours but it felt like days before I was reunited with Frank. We stayed for a week to make arrangements and attend services. It was a nice farewell and celebration of life. Frank gave an excellent eulogy. I have no doubt his dad was quite proud. We braved the cold. The mercury had risen to -8 by the time I arrived, it was bitterly cold. Colder than I've felt in a decade, more snow too. However, it was a heat wave compared to the -44 that Frank endured a couple days earlier. He's never felt cold that cold before. He hopes to never again. No one would chose to see loved ones under such circumstances, but often it does take death to bring everyone together. I suppose life just gets in the way, like it often does. Just a post ago, I anticipated all that this year would bring. I didn't expect grief to hit so soon, but life is about the unexpected. It's up to us to make the plans in between. It also serves as a reminder you never know what day will be your last, and reinforces that one must make the most of every day. We spent New Year's Eve with friends playing games and enjoying cocktails. We barely made it to midnight, we were all pooped. But we stuck it out and watched the strip erupt in fireworks from Centennial Hills. I was eager to move on to 2014, there's much to look forward to! We already have plans to travel to Albuquerque, Louisville, Ecuador and San Francisco in the first part of the year, Frank will also be visiting Chicago in February. We intend to play more in the desert and neighboring states. We'll be attending a wedding in May and we'll be welcoming a new niece or nephew in August. Celebrations of love and life are simply the best! So, I have no doubt 2014 will be filled with adventure. After travels, food is my greatest passion. I think I'm most excited for that second location of Taco y Taco to open so close to home, but I'm sure the new year will bring other newcomers. Giada's place is probably the most anticipated. Unfortunately, I see the trend of small plates, burgers and pizza to continue. I think we'll see more vegetarian options and menus that accomodate special dietary needs. Furthermore, I think uninspired menus boasting high profit margins will continue to dominate. I would like to see more of what Sage has been doing, local whole foods prepared simply. This is the year of the renovation, but I think SLS has the best chance at bringing something new. 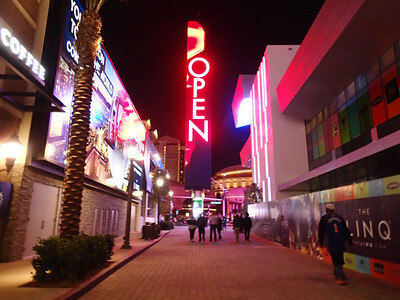 I'm excited to see the outcome of Fremont East's revitalization. Tony's world should come to fruition. Let's see if people flock to it. I'm a bit ashamed to admit I have not yet been to the Container Park. Nor have I eaten at any of the new restaurants (with the exception of Radio City Pizza) east of Las Vegas Blvd. I'll have to change that soon. I predict a lack of creativity in Entertainment too. Unfortunately, I think movies, tv and music will be more of the same regurgitated crap. Please let me be wrong! How about you, what do you think the new year will bring?